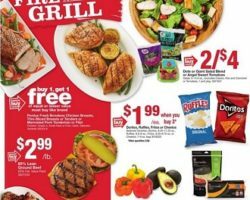 Giant Food Weekly Ad Specials. Get this week Giant Food Circular sale prices, printable coupons, current circular savings, grocery promotions and offers. Most Giant Food locations have a Pharmacy staffed with caring professionals. Giant Food first store was opened in 1936, in Washington, DC, setting the foundation for what is today a chain of over 150 supermarkets that operate across the District of Columbia, throughout Virginia, and throughout Maryland. Giant Food operates a savings center that includes the Giant Food weekly ad, coupons offerings and a rewards program in the form of a Giant Card membership and gas rewards, which essentially represent cents or dollars of the gas receipt for the number of points earned through shopping at Giant Food supermarkets. Giant Food stores carry a number of private label brands, including Guaranteed Value, Smart Living, the Giant brand, Simply Enjoy and Nature’s Promise among a few others. Altogether, Giant Foods stocks a selection of approximately 4.000 private label goods ranging from pantry and baking essentials to frozen foods, deli items and fresh meat cuts.